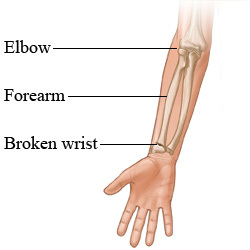 Distal Radius Fractures can occur at the distal end of the radial bones, resulting in broken wrists. Scaphoid Fractures can occur when the patient falls on the outstretched hand, with the breaking of the scaphoid bone. The fractures can be displaced (bone fragments are moved) or non-displaced (the bone pieces are in position). Greenstick Fractures or the ones that occur in children. A plaster cast is applied, if the bone is in a good position, till it heals. In some cases, the doctors might have to realign the broken bone pieces if the bone’s alignment is out of place. The process of moving the broken bone pieces into position is called Reduction and straightening the bone without opening the skin is called Closed Reduction. Once the bone is aligned properly, a splint is placed on the patient’s arm for the first couple of days to allow for swelling. The cast is added a couple of days later after the swelling subsid and is changed after a couple of weeks once the swelling subsides more and the cast becomes loose. The doctor monitors the fracture’s healing process of the fracture by taking periodic X-rays. If the fracture shows unstable healing, x-rays are taken for 3 weeks and then at 6 weeks. If the fracture is healing properly then, X-rays will be reduced. The cast is usually taken out after 6 weeks from the day of fracture and physical therapy is recommended to improve the wrist’s motion and functioning. healing process, from outside the body. Combination of any of the above techniques. This requires surgery within 8 hours after an injury. The exposed soft tissue is thoroughly cleaned and antibiotics are prescribed to prevent infection. The bones might be held in place either using external or internal fixation methods. The doctors might go for a temporary external fixator if the soft tissues are damaged. Then the doctors will resort to internal fixators like plates and screws after a few days through a second procedure. The doctors will recommend non-surgical treatments if the scaphoid bone fragments are not displaced, confirmed by an X-Ray. The doctors normally treat this fracture by putting the arm in a cast and is worn for 6-12 weeks until the scaphoid bones heal completely. The doctors might recommend the cast to be put for a longer period in special cases. The doctor will advise surgery for displaced scaphoid bone fracture. The surgeon will insert a small screw into the scaphoid bone to hold the bone fragments together in the correct position, usually through a small cut in the skin. Some doctors will suggest surgery for patients with non-displaced fractures for patients who do not want to wear casts for a long time. It will help in returning to the normal activities more quickly. This is usually recommended for athletes, but it has minor risks too.